← What’s up with SUP? 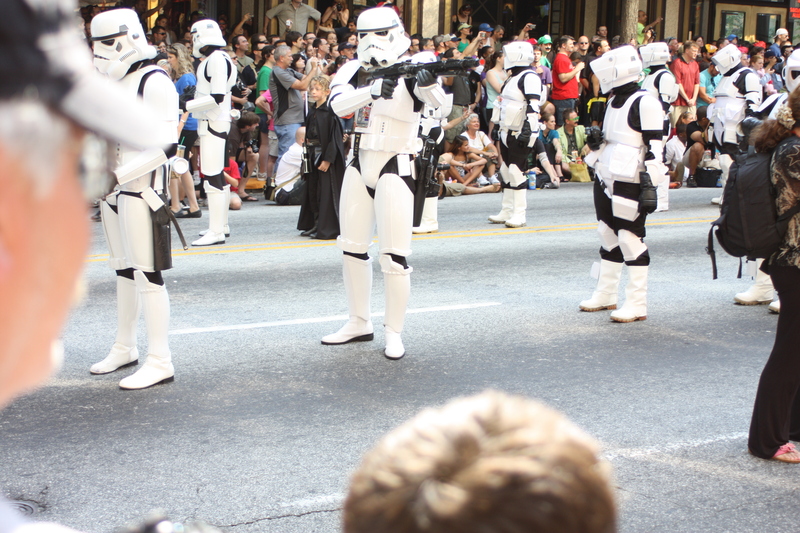 Carlton had the best view of the Dragon*Con parade last year. Does dressing in the costume of your favorite super hero make you a nerd? Does carrying a plastic gun or laser sword make you a nerd? Does donning pointed ears and makeup to resemble an elf make you a nerd? Does getting up early on a holiday weekend to go downtown and watch a parade of these people make you a nerd? My nerd tendencies have always had an uneasy coexistence with my jock inclincations. Before the days of fanboys and geek chic, I had a sense that my interest in “Star Wars,” “Lord of the Rings” and other art forms from that genre had a place, but not a very public one if I valued my reputation. Hey, these aren’t the droids you’re looking for. Put that gun away! As pop culture references to such things have become more mainstream, I’ve been a little more willing to give my inner nerd some room to breathe. And now that I have three boys who have fully embraced “Star Wars,” “Harry Potter” and “Batman” I am confronted with a dilemma: do I encourage their interest in imagination-inducing entertainment or dampen their enthusiasm for elements of nerd culture and get them to embrace more mainstream elements of pop culture? 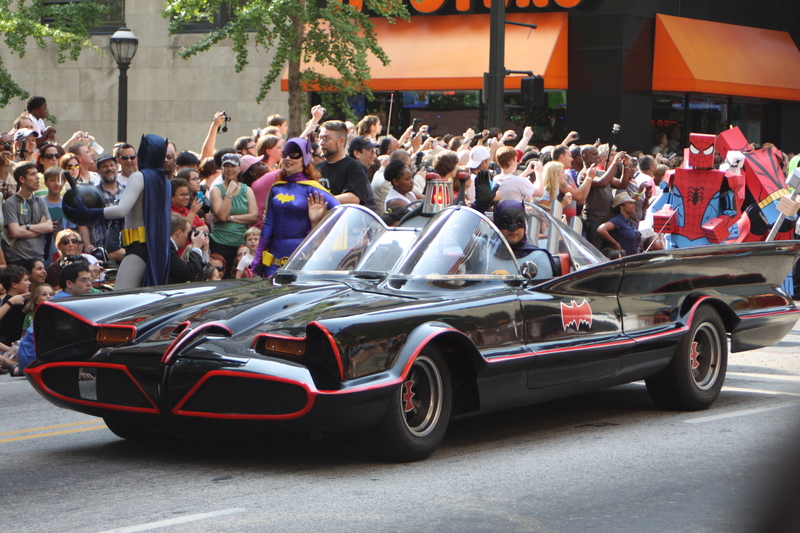 Last year I completely gave in to nerddom by taking the whole family — even Carla — downtown to see the spectacle that is the annual Dragon*Con parade. You know Dragon*Con right? It is the big gathering of nerds held every Labor Day weekend in Atlanta. Officiallly, it “is the largest multi-media, popular culture convention focusing on science fiction and fantasy, gaming, comics, literature, art, music, and film in the universe.” I can’t challenge their assertion because, frankly, I haven’t traveled much outside of our solar system. “Engine to power. Turbine to speed.” No, I’m not talking about the Batmobile, I’m talking about Barron’s heart when he saw it! We didn’t buy tickets to the event, so it was a fun, cheap way to spend a Saturday. The boys got to see people dressed in costumes of their favorite characters, including a 1966 replica Batmobile (Barron’s current obsession) and I got to relive a portion of my own childhood with all the Star Wars costumes. The float and characters promoting the haunted houses were a little much for Carlton, who was 2 years-old at the time. Otherwise, it was a family-friendly parade. So why am I going back again this year? 1. It’s fun. It’s not every day you see people trying to bring to life fictional characters who live only in your imagination, on the movie or television screen or in books. It has the same vibe as running into a celebrity at the airport, only that usually doesn’t involve plastic weapons. 2. It’s a time to bond with my boys. 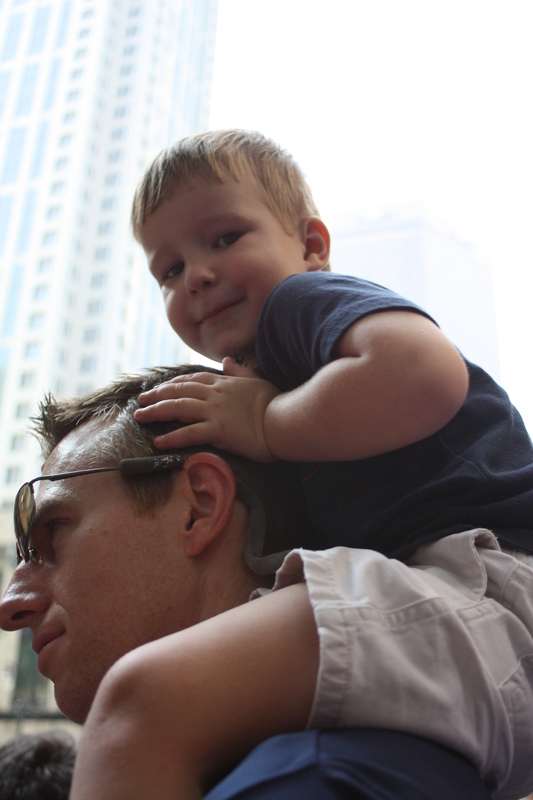 I’ve dedicated a lot of space in this blog to talking about how I bond with my children. Camping is one way. Engaging in the “campy” elements of pop culture is another. 3. Who doesn’t love a parade? I still remember sitting on the frozen curb as a child watching the Cotton Bowl parade with my friend, Ryan, one New Year’s Day. It’s a spectacle, and the democracy of the Dragon*Con approach of taking all comers (who sign in and arrive at the check point on time) is refreshing. There’s really no skill involved. And it’s interesting to try to pick out what each group of nerds is representing. There are some pretty obscure corners of pop culture represented, and fortunately, my friend, Rob, is an expert who can help identify the more niched references. 4. Sometimes the real world is just a downer. There’s world hunger, hurricanes, war in Syria, stalled economy, crime, etc., etc., etc. Being transported to another place and time for a few hours may not be productive but it does make it easier to cope. 5. I’m still a kid at heart. As much as I try to repress my urge to pick up a light saber and run around the yard joining in my boys’ Jedi combat, I must have an outlet for my inner child. Yes, it’s a little nerdy to always be quoting Obi Wan Kenobi (“Trust your feelings”) or Gandalf (“It’s the deep breath before the plunge”) at the office, but giving space for these fantastical diversions moderates the highs and lows of a workday. So if you’re looking for me Saturday morning, I’ll be at the corner of Peachtree Street and International Boulevard hanging out with my boys watching the denizens of Dragon*Con strut their stuff. And if that makes me a nerd, well, so be it. Do you have hidden nerd tendencies? What’s your secret nerd indulgence? Go ahead and get it out in the open. You’ll feel better. We won’t laugh. I promise. This entry was posted in Uncategorized and tagged Batman, children, comic books, contemporary South, costumes, Dragon con, dragon*con, family, fanboy, fantasy, geek chic, harry potter, Labor Day Weekend, Lance Elliott Wallace, Lance Wallace, lord of the rings, New South, New South Essays, NewSouth, parenting, pop culture, science fiction, South, Southern, Southern Culture, Southern Living, Southerners, Star Wars, the South. Bookmark the permalink. Never knew my capacity for nerd ness until I married Jeremy. We actually had the date on the calendar for when the Tumbler came through this summer! Have you seen Firefly? More than one good quote to be found there, my friend!